Enjoy live entertainment at a number of venues at Henley Square, sit in the sun with a coffee or drink, indulge in some retail therapy and pampering, or enjoy or a leisurely meal at one of the many cafes or restaurants. And make sure you have your camera at the ready, to capture the magnificent sunset most evenings. The simple pleasures are all on your doorstep. Venturing into Adelaide is quick and easy – the city centre, with all its attractions and facilities is just a short trip up Henley Beach Road. You can be at the iconic Adelaide Oval, the National Wine Centre, Adelaide Festival Centre, Convention Centre, Museums, Art Galleries, Department Stores and specialised shops in a very short space of time – either by car or public transport. Continue thru the City and in a few minutes you’ll find yourself in the Adelaide Hills, where you can try some fine wine, visit the National Motoring Museum, pick your own strawberries, cuddle a Koala or marvel at the most magnificent display of Autumn leaves. 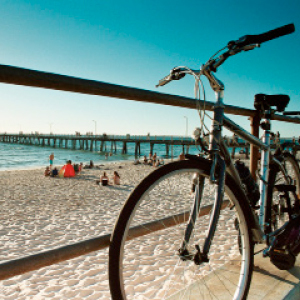 Henley Beach’s adjacent seaside suburbs to the South and North also have plenty to offer. There’s the Maritime Museum and adventure kayaking with the dolphins at Port Adelaide and you can catch a fishing charter or a dolphin cruise at Glenelg. Enjoy a round of golf, a local market, some more shopping, and adventure, then come home to Henley Beach. The world famous Barossa Valley, McLaren Vale and Victor Harbour on the Fleurieu Peninsula, and the Clare Valley are all a very comfortable day trip from Henley Beach, even allowing time to be back at Henley for yet another perfect dinner time sunset. And even the ferry to Kangaroo Island and all its attractions is just over an hour’s drive away. After a day away, come back to the simple pleasures of Henley Beach.